Emily sat silently on the back door’s brick steps. Her big blue eyes watched my every move—back and forth from the garage storage room to her Granddaddy’s gold and white GMC pickup. But when her big brother carried out a tackle box and his Zebco, the storm clouds gathered in her 3-year-old face. And when I leaned over to kiss her good-bye, blueberry-sized tears rained down her cheeks. “I wanna go, too!” she bawled. All the way out the Lanes Bridge Road, Emily chirped, “We are going to the city dump … the city dump … I can’t wait.” As I listened to her excitement, I began to feel ashamed of touting such a smelly place. But, ahhhhh, the garbage gods smiled on me. The minute I backed into the off-loading spot, Emily spied a huge earthmover lumbering our way. And then the monstrous diesel engine began to groan, as the massive yellow machine mired into the slick red clay. Emily was captivated, so we sat on the tailgate to watch. One bulldozer came, only to be sucked into the muck, too. A second bulldozer arrived. Looking like a string of circus elephants—hooked nose to tail—Emily cheered, as the Caterpillars, belching black exhaust, inched out of the bog. Thirty-seven years later, I am not laughing about the idea of taking Emily’s four sons or their four cousins to the Broadhurst Environmental Landfill. 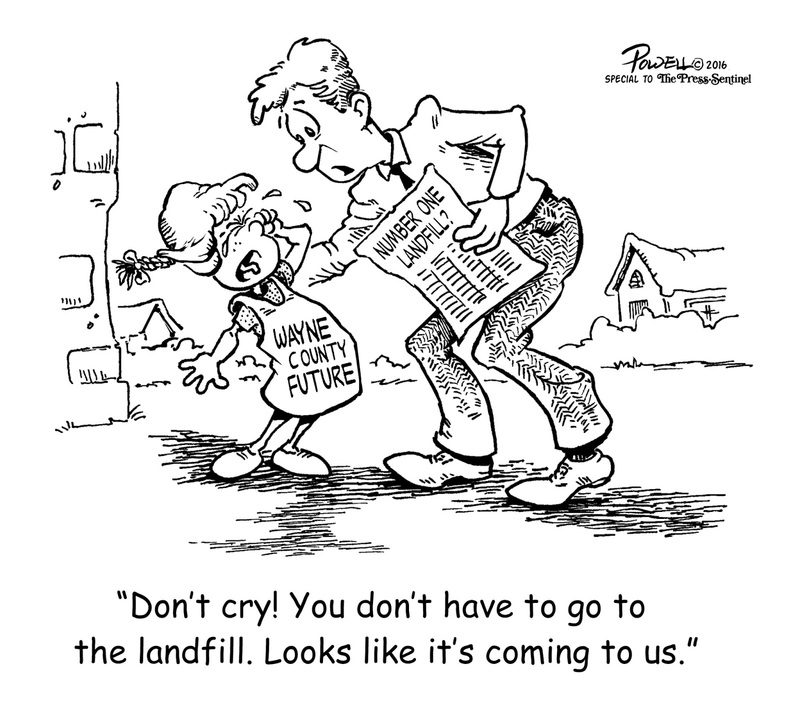 Granted, Republic is much better equipped to handle garbage than Wayne County was in 1979, but the sheer volume and proposed makeup of today’s waste are nightmarish. According to trashinc.cnbc.com, Republic Services operates two landfills which take turns being the nation’s largest. Newton County, Indiana, accepts an average of 9,100 tons per day, and Apex Regional Waste Management Center in Nevada loads up with 9,200 tons per day. If the United States Army Corps of Engineers grants Republic’s rail-spur permit, Broadhurst could easily become number one while earning us the title of the East Coast’s dump. In addition to the normal 1,300 tons per day already being trucked into Broadhurst, imagine the horrifying proposal of 10,000 tons of toxic coal ash—daily. Consider the added pollution risks. Now, that’s something to make us cry: noooooooooooo! And I’m not talking about little-girl crocodile tears. This, my friends, ain’t funny.